Is anyone feeling like me at the moment and wondering if there’s going to be anything on the shelves once the time comes for serious Christmas shopping. Scrabbling around trying to find the wherewithal for an afternoon’s baking, I could suddenly envisage an empty freezer and some very disappointed Christmas partygoers. Being held up on the road in a 5km tailback is annoying and of course we should be sympathetic to their cause but if a girl can’t get her vittles then what is a girl to do? Thank you to all who came and supported us at the Christmas Market last Sunday. 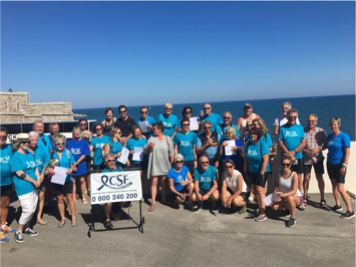 You will be delighted to know that, as well as meeting and talking to people, we raised just over €500 after a donation of €120 to La Ligue contre le cancer. Come and have a chat at Pablo’s Bar – meet up with friends and browse through the books. Stay in Céret for a while and do a bit of Christmas shopping. At the Café des Artistes there’s a good turn-over of paperbacks, English and French. Also CDs and DVDs. You can buy a coffee and take two books. There will be no Drop In at Lizzie’s this month. Our AGM will be held at the Restaurant L’Oliveraie, 850 Boulevard Denis Papin, 11000 Carcassonne (just off the A61). It’s the 10th Anniversary of CSF Sud! At this special meeting we’ll be looking back as well as forward. It will start with coffee around 9.45 and finish with lunch at 12 noon. More details on this next month. As you probably know, Penny will be handing over the role of President (of CSF Sud) to Ron Reid so this may be a good opportunity for you to meet him. Everyone is welcome (although you have to be a member to vote) so make a note of the date and come and join us. Car-sharing is always a possibility so let me know if you need a lift or if you have room for someone in your car. This is our annual get-together when we meet up for a short meeting and a long lunch! It’s very informal and everyone is welcome. 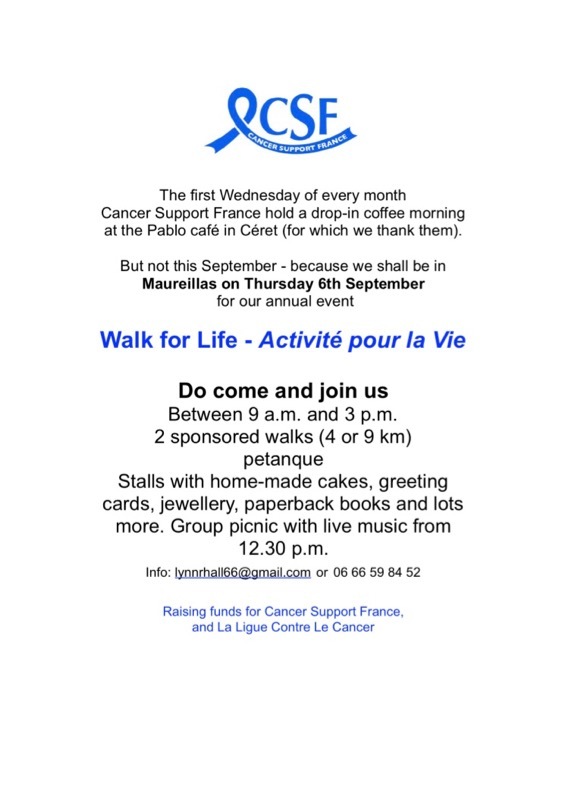 We are delighted to say that our speakers will be Alain and Monique Perrault from La Ligue contre le cancer. Their talk is called « A Brief History of a Hundred Years of La Ligue – its role and its research » . The meeting will start at around 10.15 and end with a three-course lunch. I will be sending an official invitation in January. In May 2019 our cycle ride will take place over 5 days in the Languedoc-Roussillion! Participants will cycle through some of the most diverse landscapes, cycling from Mazamet in the Montagne Noire to Bedarieux (Haut Languedoc national Park) and then from Béziers to Perpignan where we expect a big welcome on our home turf! 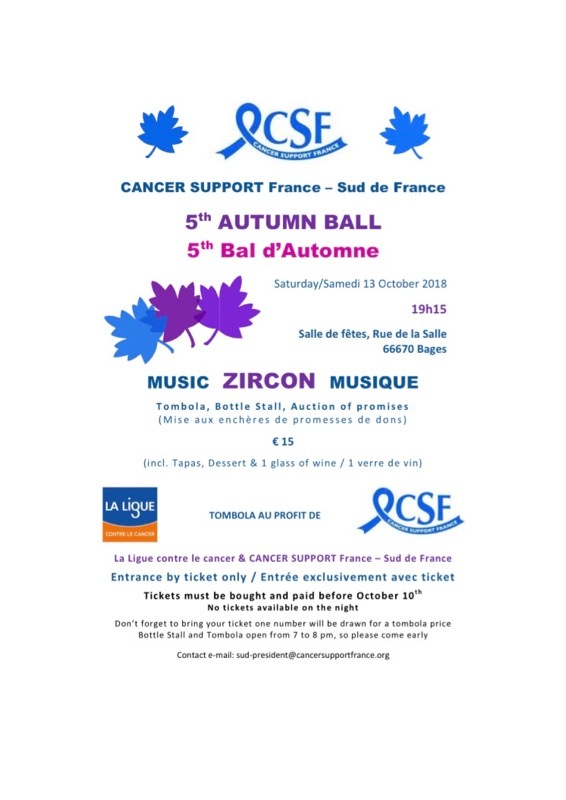 If you feel you may be able to help at any time during the five days, then please let Penny know (sud-president@cancersupportfrance.org). There is no obligation at this early stage in the planning, but it will ensure that you are kept up to date as plans progress.